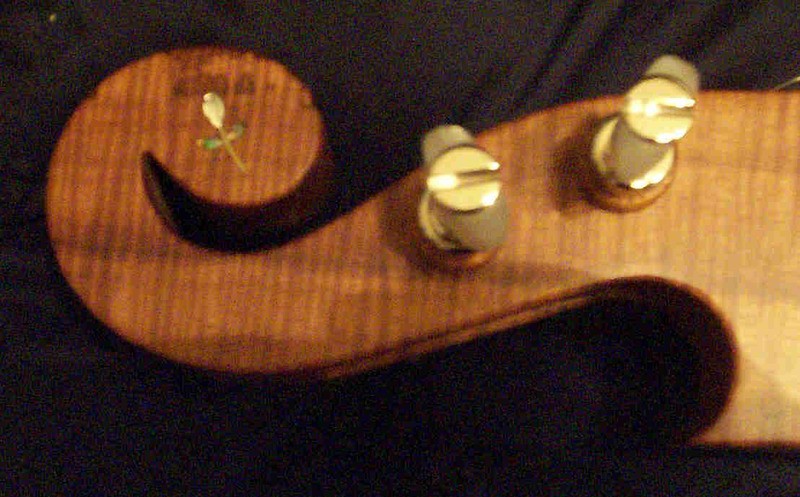 For some time, I had wanted a koa dulcimer built by Bob and Janita Baker of Blue Lion Instruments. My first dulcimer was definitely a "starter," but I have played a Blue Lion dulcimer since I purchased one from Janita at the old Memphis Dulcimer Festival in about 1992. They build wonderful instruments that are such a joy to play and so beautiful to look at. Janita and I talked, plotted, designed and re-designed for a long time to finally put together the inlay design for my dulcimer. When Janita first posed the flower garden idea, my initial thought was, "I have no idea what flowers I could use." Then, like a flash, a stream of flowers began to pour though my mind – each with a special story attached. I prepared a list of the flowers that I wanted, and we began to work toward a design. All of my dulcimers have names. Usually, the name strikes me as soon as I begin to play. In this case, I knew what she would look like, sound like, feel like, and what her name would be before Bob and Janita started to build. She is named Minnie Belle for my aunt, Min Peery, whom you’ll read about below. Aunt Min was married to Bob Peery, who spent many long hours singing old mountain songs to me and started my love for the old folk songs. 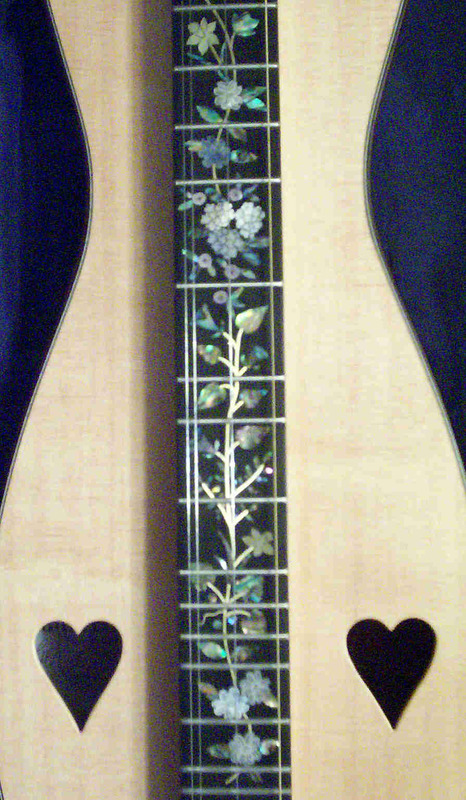 These are pictures of the final design, along with the stories that prompted me to include the flowers that grow along my fretboard. At the top are two sugar maple leaves. There were two sugar maples outside my bedroom window. My granddaddy, James Watson, planted them when the house was built. They were big and perfectly shaped. On hot, lazy summer days, I would climb into one of the trees. It had a limb that made a perfect seat, and I could lean back against the trunk. Even on the hottest days, it was cool amid the leaves. I would read books and write poems and letters and look out across Garland Delozier’s corn fields toward the Smoky Mountains. I loved those cornfields. When the stalks were high, I would wander through the field, pretending to be lost in a maze. All you could see were walls of corn around and blue sky above. Next are pink and white dogwoods, which are also at frets 6-1/2, 7 and the end of the fretboard. In Knox and Blount Counties, every spring they have the Dogwood Arts Festival. There are areas that are known especially for their flowering dogwoods. The streets with the prettiest trees are marked with pink stripes down the roads so that people can drive along the trails and see the trees. My aunt, Minnie Belle Watson Peery, lived along one of the trails in Maryville. Some of the trees are white, some are pink (Cherokee Princess, they are called), and some are grafted to have both pink and white blossoms on one tree. Aunt Min had a beautiful dogwood with both pink and white flowers. One year she told me to go trim the tree back because it was near the driveway, and the branches were scraping the sides of the car. I guess I trimmed too much and cut back on the graft because, after that, the tree was always white. Every year when the dogwoods bloomed, Aunt Min would say, to whoever would listen, "See that tree? It used to have pink blooms on it til you trimmed it! You must have really trimmed that one good!" And she would laugh and laugh. She always thought that everything I ever did was funny and fine. The roses at fret 2: My great granddaddy, Nathaniel Juan Watson ("Nat J. "), and my great grandmother, Esther Macom Leslie ("Essie"), had climbing roses all around their porch. When my granddaddy, Jim Watson, brought home my grandmother, Mildred Lee Coulter, Nat J. said she was "as purty as a rose." That really pleased my grandmother, because she always took a lot of care about her looks. Til his dying day, whenever he saw my grandmother, Nat J. would tell her she was "purty as a rose." It was funny that Grandmother would be so particular about her looks because she was a terrible tomboy when she was young. Everybody called her "Pug" because she had a little pug nose. She played basketball for Everett High School, and she was really good. One year, the boys team came up a player short. Grandmother was such a good player that she got to play for the girls team AND the boys team. The girls team always wore bloomers that came below the knee. One time, a team from the city came in to play, and the girls wore uniforms with shorts that were above the knee. Not to be outdone, the Everett High girls team pulled their bloomers up above their knees to be more like the city girls. When they came out to play, the coach had a fit and marched them all back into the dressing room and made them pull their bloomers back down below their knees. They were very mad. The rosebuds on either side of the peghead are also a tribute to "Pug." Daffodils at frets 2, 6 and 12: When my daddy was growing up in the rolling hills of northern Alabama, along what became part of the Natchez Trace, the hills behind his house would be covered with yellow daffodils each spring. He called it Daffodil Hill. It was one of his favorite places, and the daffodils were his favorite flowers. When I would visit my Granny and Pap, I loved to walk over Daffodil Hill, and it was one of my favorite places, too. When my daddy grew up and got his own farm, he and my mama planted daffodils all over one of the hills and called it Daffodil Hill after the hill from his childhood. When I grew up and got my own small farm, one of the first things I did was begin to plant daffodils on the hill. The first year, the deer ate all my bulbs. So I planted more daffodils. The second year, the deer ate all my bulbs. So I planted more daffodils. The third year, a few of the bulbs made it past the deer. And each year I add a few more, wait for the others to spread, hope that there will be enough for the deer and still have a few left for me, and look toward the day when my own Daffodil Hill will be covered with yellow blooms each spring. Aunt Min also loved mountain wild flowers. She had a jack-in-the-pulpit that grew under a great big boxwood in the front flowerbed. I don’t know where it came from. All of the cousins would be chasing around the house, and she would call out, "Jack’s here! Go see if you can find Jack!" And we’d all go running out the front door and scoot on our bellies up under that boxwood to see Jack sitting in his pulpit. Frets 3, 13, 13-1/2: The muscadines (pronounced "musky-dimes" around here) are the wild grapes that grow in the woods. Many times they grow high into the trees. When I was little, my friends and I would go into the woods and climb trees to pick the muscadines. They tasted so good. The rinds are tough and sour, so we would bite on the grapes and squirt the juicy centers into our mouths and then spit out the rinds. We would eat all we could hold and then carry home as much as could, filling our shoes and pulling the bottoms of our shirts up and filling them. They make great jelly and wine. Fret 4: My favorite flower is the common purple violet. They grow by the bushels around my yard. (Some claim they are weeds, but I don’t believe them.) I love the heart-shaped leaves and the way the head of the bloom bends down, like it is bowing its head in prayer. I let the violets take over as much of my yard as they want. I also try to mix in some of the white violets, just for fun. The blue butterfly at fret 4 was included for several reasons. It is a part of the story of Bob and Janita Baker and their life and life’s work together and is a gift from my dear friend Janita. It is also a symbol of the duo of myself and Betty Dawson, a wonderful, steadfast friend and talented hammered dulcimer player. We play together under the name "Butterfly Gap." Gladiolus. The flower for August, my birthday. Grandmother had a huge garden filled with every vegetable you could imagine. Along the edges of the garden, she grew red, pink and white glads. My mother loves iris. She had tiered flowerbeds filled with hundreds of iris in every color and type. Some smelled like orange peel; some were solid colors; others had stripes along the edges of the petals. We spent many hours weeding, separating and replanting the bulbs. The purple iris is the Tennessee state flower, and I especially love the deep, velvety purple. I always think of my mother when I see an iris. The tulip poplar is the state tree of Tennessee. I love how it grows so straight and tall. And I like the unusual orange and green cup-like flowers. That are shaped like tulips. When I was a little girl, my grandmother took me up into the mountains to see one of the old-growth poplars. The tree had fallen, but the trunk was still there. It was at least five feet across. The mountains were full of huge old-growth poplars before the loggers came in. Poplar wood lasts forever and never rots. Many of the log cabins were build of poplar, and the logs are good even today, over 100 years later. Fret 8: The rhododendron and mountain laurel are some of the most famous wildflowers in the Appalachian mountains. The pink flowers cover the mountains during the early summer. Roane Mountain in North Carolina is especially well-known for its rhododendron. Uncle Bob, Aunt Min, Grandmother and I would drive all through the mountains looking at the blooms every year. And again, when I got my farm, I planted a rhododendron along the bank of the creek. Even though it is not native to middle Tennessee where my farm is located, the terrain and weather has been close enough to support my transplant. And the elevation is just high enough that all through the woods on my farm I can find some of the very same wildflowers that I loved to see in the mountains when I was growing up. Frets 9 & 10: On the white board fence around our yard, there was a large clump of morning-glories growing all over. It was thick and full like a shrub instead of a vine. The flowers were pale blue, and blue being my favorite color, I loved the little flowers that bobbed in the breeze. In the mornings, I would hear my grandmother get up and go to the kitchen and begin shuffling dishes and pots and making general "kitchen noises." I could smell the coffee perking all the way in my room at the back of the house and could hear the news and weather being announced on WGAP through the old table top radio that sat on the counter. Even though I was awake, I would lie quietly because, in a few minutes, when my grandmother would come in to wake me, she would open the curtains to let in the sun and brightly chirp, "‘Mornin’, Glory! Did you bring the afternoon paper?" I think of those wonderful mornings every time I see a morning-glory. 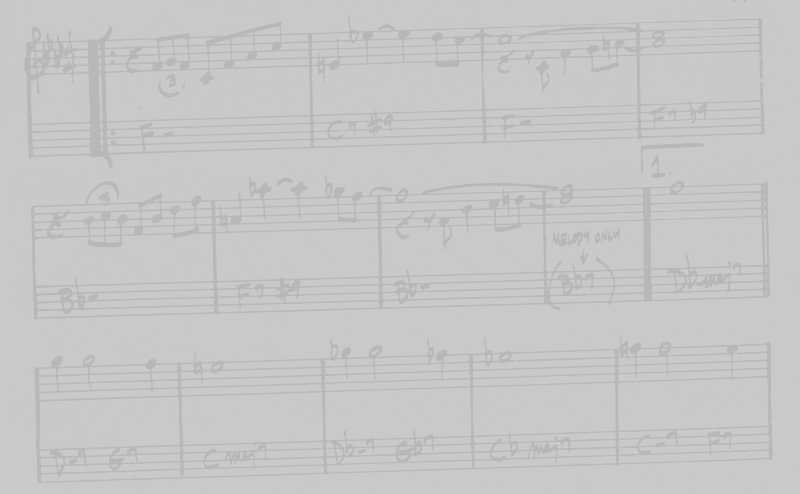 Frets 11/12: When I was little, blueberries grew wild on the top of the mountain. The bushes were small, about a foot or so high, and the berries were small and dark. Some mornings we would go up to the top of the mountain and pick blueberries and bring them home for Grandmother to make blueberry pancakes. When I bought my farm, I was again delighted to find wild blueberries scattered all around, just like the ones that grow in the Smokies. Last, but not least – the water at frets 4 and 5: The stream of water running through frets 4 and 5 is for the Little River that runs out of the mountains and into Maryville and the Little T, which is now history, dammed by the TVA. My Aunt Margaret’s family farm, the Davis Farm, is along the Little River, and we spent many summer days picnicking and fishing along its banks. I spent many long hours refusing to leave the cold waters of the river, swimming at the "Y" and gathering smooth river rocks. My Aunt Ida Mae and Uncle Lalee Wells lived along the Little T where Uncle Lalee ran a sawmill. Everyone was always welcome there, and it was the kind of place that everyone wanted to be. The waters of the rivers are notoriously dangerous, in part because the river doesn’t always look like it is dangerous. The currents run below the surface and can surprise the unwary swimmer. One time I wanted to go to the mountains and go "tubing" down Little River. Grandmother and Aunt Min were against it. I insisted. I piled into the car with the rest of the group, and we headed to the mountains. Little River runs directly along side the road into the mountains. We had begun our float and were drifting along having a good time, when I looked up to see Grandmother and Aunt Min walking along the edge of the road. They had driven up to the mountains and parked above the "Y" to supervise and be sure that nothing happened to me. They refused to leave and, despite being in their 60s, walked a good mile and a half down the mountain as I floated in the river. At the time, I was greatly embarrassed. Now, in my old age, I realize that I have never been loved as much as they loved me. So in the end, that is what this dulcimer is about. Love. My love of music, my family, my friends, my memories; of Bob and Janita; of the tradition of the mountains and of the dulcimer. And, of course, life itself.